In Brazil, soccer is a national passion. In World Cup Year, the country literally stops to watch the national team fights for one more title. Brazil is often said to be the country of samba and football, and it would be a difficult task to decide which one is more popular. Football is the main sport in Brazil, with millions of supporters. Players from the smallest to the largest teams give their heart and soul during games. There are entire industries and traditions dedicated to football, making it one of the most important elements of Brazilian culture. Everyone has a national team they support and follow, regardless of age or gender. In fact, children are taught from a young age to support one of their parents’ teams. The Brazilian Championship, or Brasileirão as it is known locally, is an annual football competition of Brazilian teams, which has been happening since 1959. It has several categories, or Séries; Série A includes the 20 best teams in the country, and it goes down all the way to Série D with the semi-professional teams. For Série A, the teams that place in the first four positions go on to play in another tournament with the best teams from all of South America, in a tournament called the Copa dos Libertadores (the Freedom Cup). The five teams that won the most championships in Brazil are Palmeiras (9), Santos (8), Corinthians (7), São Paulo (6) and Flamengo (5). The teams with the largest number of supporters in Brazil are: Flamengo, Corinthians and São Paulo. Flamengo is the team with the largest number of supporters in the world, at 32.6 million. It is the best-known team in Rio de Janeiro and has won five Brazilian National Championships. The next team is Corinthians, with about 23 million supporters. The team is from São Paulo and has won the Brazilian National Championship four times. Lastly, there is São Paulo with about 15.3 million supporters. It is the third most successful club in Brazilian football and one of the most successful clubs since the Série A’s creation in 1971. São Paulo won the Brazilian National Championship six times. Despite widespread support for the local teams, the true beauty of the Brazilian football culture is seen during international events, such as the FIFA World Cup, where the entire country comes together as one to support the Brazilian football team. During the 2010 World Cup, Google performed an experiment in which they compared how many Google queries are carried out in a country on a typical day to those during a World Cup game. It was no surprise that Brazil showed the biggest dip during games, with its queries dropping by half during its football games. This describes perfectly the Brazilian habit to stop everything during the World Cup. 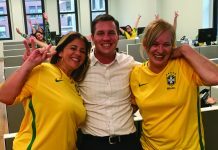 Schools let children out earlier, so they can follow Brazil’s games, and companies supply televisions in the office so employees can follow the game. Shops close, and for the 90 minutes that the Brazilian team is playing, there is little else going on. The further the team goes into the competition; the more life stops. During the World Cup there are concerts, events and huge screens showing the games in virtually every Brazilian city. Ask any Brazilian on the street what they think about the performance of the Brazilian team, and you’re likely to get a detailed answer of how they’re doing, and suggestions for improvement. During the World Cup, every Brazilian is a football coach! The World Cup shows Brazilians’ passion for football and how important it is to their culture. The country is as successful as it is passionate, having accumulated five titles, more than any other nation in the world. Football in Brazil is more than just a sport, it’s a lifestyle. Therefore, if you really want to feel Brazilian and part of the country’s culture, you may want to give this sport a try – whether it’s watching a game on television or playing it. The World Cup tournament is a great way to begin. Don’t miss the opportunity. It happens just every four years.